Centre for Owner-Managed Businesses can be found at Copenhagen Business School, Frederiksberg - close to the centre of Copenhagen and easy to reach by public transportation. 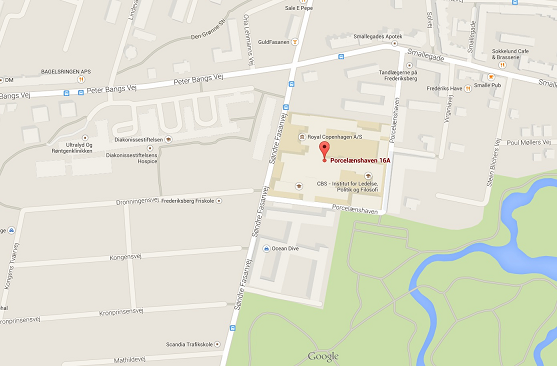 By car: We are located nearby the Peter Bangs Vej and Søndre Fasanvej crossing. There are several 2-hour parking spaces close to Porcelænshaven. On the west side of Søndre Fasanvej you may park without time restriction. If you need to park more than two hours close to our office, one option is to pay for your parking is via Easy Park’s App. Please note that this option requires that you sign up for Easy Park. By metro: The closest metro station is Fasanvej (approx. 500 meters walk) with frequent service every 3-5 minutes during day time. From the Copenhagen Airport, take the Lufthavnen/Vanløse line to Fasanvej (the trip takes 20 minutes). From downtown Copenhagen (Kgs. Nytorv Metro Station) and Fasanvej, the metro takes 7 minutes. By bus: Bus 4A runs on Søndre Fasanvej between Valby Station and Porcelænshaven every 5-10 minutes during day time. The trip takes 10 minutes. Buses 14 and 15 runs on Smallegade.